Mary Anderson was born in Melbourne, where she was taught both harp and piano from four years of age. Initially, she was taught at home, first by her grandmother, Mrs. Maud Bendall, and then by her aunt,Rosalie Bendall. She studied the harp subsequently in London with Tina Bonifacio , and in The Hague with the Dutch soloist, Edward Witsenburg . From the University of Melbourne, she holds the degrees of B.Mus., studying the harp under the direction of Huw Jones , and B.A.(Hons. ), majoring in French and Fine Arts. She worked in London for three years as a free-lance player receiving consistent work as either first or second harp with all major free-lance orchestras and various provincial orchestras, and in addition she played frequently for both opera and ballet. 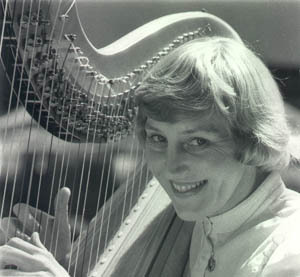 Mary spent three years as principal harp with the New Zealand Symphony Orchestra, and then worked for ten years for the Australian Broadcasting Corporation in the position of second harp in the Melbourne Symphony Orchestra, during which time she played both first and second harp in every one of the six A.B.C. orchestras. Since 1988, she has been principal harp in Orchestra Victoria, having previously played regularly with this orchestra as a casual player on either first or second harp since returning to Melbourne, and for a brief time she played as principal harp for the Australian Opera and Ballet Orchestra in Sydney. She has worked often in theatre orchestras for numerous musicals as well as for opera and ballet, and has played in a wide variety of radio, televison and film studio orchestras both in London and in Melbourne. Mary plays frequently as a soloist, performing both the classical harp repertoire and lighter music. During the 1980's she played seven days a week at The Regent, Melbourne, and five nights a week at The Parkroyal on St. Kilda Road in Melbourne. 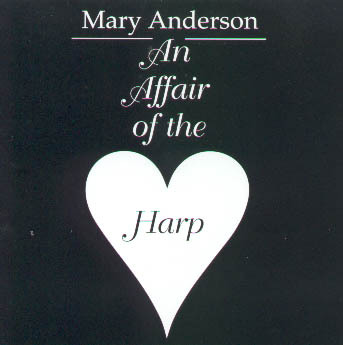 In 1984 she released a recording of light music for solo harp, entitled "An Affair of the Harp". For this sort of work, as well as on this recording, she plays all her own arrangements. Mary has played many works from the harp solo repertoire proper for both the New Zealand Broadcasting Corporation and the Australian Broadcasting Corporation. She plays a great deal of chamber music and has performed often as a soloist with various choirs in Melbourne, recording Benjamin Britten's "Ceremony of Carols" on CD with the Ormond College Choir. Mary acts as an examiner in harp, and is the Victorian representative on the Harp Specialist panel for the A.M.E.B. She has written a book linked to the A.M.E.B. examination syllabus, entitled "Sight Reading Examples for Harp", and she has worked as a part-time tutor in Classical and Romantic Music History for the University of Melbourne. E-mail info@tarahall.com with questions or comments about this web site.